From Seattle, head East on I-90 to Snoqualmie Pass. Get off at the denny creek exit and head towards denny creek campground. Drive pass the campground and you will come the the franklin falls TH. Take a left at that road and cross the bridge til you reach the melakwa lake trailhead. 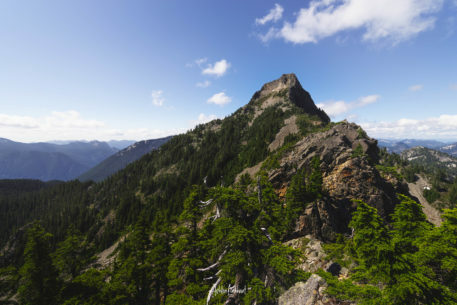 Here is a photo of Kaleetan Peak in Snoqualmie Pass, Washington. Ascending up to the left from the Melakwa Lakes you will come up on a ridgeline and stare the peak directly in the eye as you approach it.